Vineyards and grape varieties: 433.8 hectares, of which 99.6% Chardonnay, 0.4% Pinot Noir, and <0.1% Pinot Meunier. Noted for: Chardonnay from grand cru-classified vineyards. Google Maps view with the villages in the Côte des Blancs highlighted. The grand cru villages, including Le Mesnil-sur-Oger, are shown in green, and the premier cru villages in yellow. 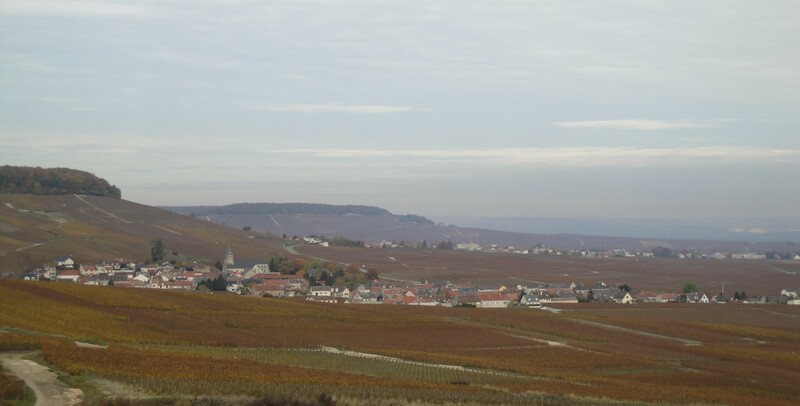 Le Mesnil-sur-Oger with surrounding vineyards seen from the slope southwest of the village in October 2011. The village in the distance is Oger. Le Mesnil-sur-Oger is located to the southsoutheast of Épernay, as one of the villages on the “genuine” Côte des Blancs slope. The village itself is located in the the slope and just below it, along the D10 road that runs from Épernay to several of the other Côte de Blancs villages. The Le Mesnil-sur-Oger commune covers 791 hectares and has 1172 inhabitants (as of 2012), referred to as Mesnilois and Mesniloises. In Le Mesnil-sur-Oger there is a Musée de la Vigne et du Vin, a museum with e.g. features a collection of older winemaking equipment and which is connected to Launois Père & Fils. Musée de la vigne et du vin. Picture linked from Wikimedia Commons (photo G.Garitan, 2015). The vineyards in Le Mesnil-sur-Oger are located around the village. East-facing slopes dominate in the village, but vary from steeper inclination above the village (close to the forest on top of the Côte des Blancs hill) to almost flat land below the village, east of the D10 road. The current vineyard surface in the Le Mesnil-sur-Oger commune is 433.8 hectares (1071.9 acres). There are 432.1 ha Chardonnay (99.6%), 1.5 ha Pinot Noir (0.4%), and 0.2 ha Pinot Meunier (<0.1%). Numbers from CIVC, as of 2013. In 1997, the vineyard surface was 417 ha. There are 482 vineyard owners (exploitants) in the commune. Champagne houses that control vineyards in Avize include Duval-Leroy, Moët & Chandon, Roederer, and Taittinger. Les Carelles is a vineyard site located just above (to the west of) the village itself. Jacques Selosses (in Avize) produces one of their vineyard-designated Champagnes (lieux-dits) from this site, composed of 100% Chardonnay. In similarity to the others, Les Carelles is produced using oxidative oak barrel-treatment in a solera, and is non-vintage. Les Chétillons is located to the southeast of the village, on relatively flat land between the D9 road and the railroad. Pierre Péters has three plots of old vines in this vineyard (which they bought in 1930), and it is used to produce a vineyard-designated vintage Champagne that sits at the summit of their range. Pierre Moncuit’s Nicole Moncuit Vieille Vigne originates from old vines in this vineyard. 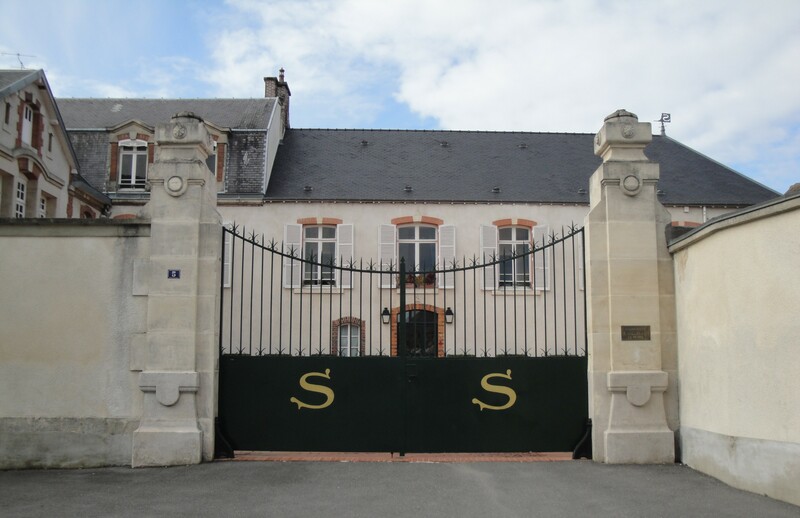 Clos du Mesnil is a wall-enclosed vineyard of 1.84 hectares that is located in the middle of the village. This vineyard is owned by Krug and is used for a vineyard-designated Champagne that has been produced since the 1979 vintage (which was released in 1986). Krug bought the vineyard in 1971, but then it was in a bad condition, so it was only after replantation it was usable for its own Champagne. Krug Clos du Mesnil is counted by many as the best Champagne there is. The wall around the vineyard was bought already in 1698, and the vineyard was called Clos Tarin before being purchased by Krug. Judging from the 1944 Larmat vineyard map, Moët & Chandon owned the vineyard at that time, and apparently it was in the hands of Salon before Krug bought it. Le Montjoly. From the 2012 vintage, Pierre Péters has produced a vineyard-designated vintage Champagne from this site, but it has not yet been released. Other vineyard sites in Le Mesnil-sur-Oger include Les Mussettes. Champagnes produced from grapes from Le Mesnil-sur-Oger tend to get very mineral-dominated and firm in style, and are also described as elegant and complete. They also have a reputation to be those blanc de blancs Champagnes that are the most time-demanding and therefore should be cellared. In this area, it is likely that Salon has contributed to the reputation of the whole village. Although each of the neighbouring villages on the Côte des Blancs are said to have a style of their own, the difference between Le Mesnil-sur-Oger, Avize and Oger isn’t too large, considering the similar location of their vineyards. Producer and vintage is likely to play a more important role in determining the style than the specific village within this area, as well as the location of the specific vineyard(s) – in the slope above/around the villages or below on the flatter land. Le Mesnil-sur-Oger is one of 17 villages that were scored 100% on the now defunct échelle des crus scale. It has kept the grand cru status after the scale was abolished in 2010. Le Mesnil-sur-Oger was promoted from premier cru to grand cru status in 1985, together with Chouilly, Oiry, Oger, and Verzy. Many Champagne lovers today are surprised to know that Le Mesnil-sur-Oger wasn’t a grand cru village when there were only twelve of them, since two truly iconic Champagnes originates from this village: Salon and Krug Clos du Mesnil. 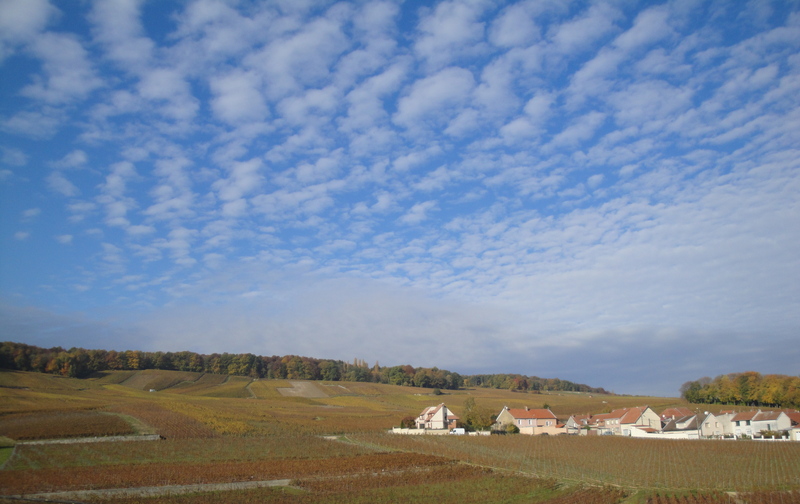 Vineyards above Le Mesnil-sur-Oger in October 2011. Delamotte, whose vintage Champagne is a blanc de blancs from Le Mesnil-sur-Oger, Oger, Avize, and Cramant. The Delamotte Champagne house was founded in Reims in 1760 by François Delamotte, who had large vineyard holdings in Cumières. His son Nicolas Louis Delamotte died in 1837, and this son’s widow Marie Pierrette Barrachin ran the firm together with Jean-Bapstiste Lanson under the name Veuve Delamotte-Barrachin. In 1856, Jean-Baptiste Lanson took over the company; he was also the one who gave the Champagne house Lanson its name. In a later generation, Marie Louise de Nonancourt was a daughter of the Lanson family. When her husband died in 1924, she decided to take control of the family’s business. In a time of economic troubles, she bought Laurent-Perrier in Tours-sur-Marne and at the same time inherited Delamotte. In 1927, the decision was taken to relocate Delamotte to Le Mesnil-sur-Oger, apparently connected to the importance of grape supply and Chardonnay being the favored grape variety of the house. Her son Charles de Nonancourt led Delamotte from 1948 to 1988, while his older brother Bernard took over the management of Laurent-Perrier in 1949, which then was a separate house although the owners were in the same family. In 1988, Bernard de Nonancourt bought Delamotte and integrated it in the Laurent-Perrier group. Salon produces a Champagne with definite iconic status. The Salon range consists of a single Champagne which is a vintage blanc de blancs. Due to the large S that nowadays is found on the label, the Champagne is sometimes referred to as “S de Salon”. The grape material originates entirely from Le Mesnil-sur-Oger, which means that Salon is a monocru Champagne. The house has its own vineyard of 1 ha which they call Le Jardin de Salon, and they also buy in grapes from 19 other small vineyard plots in the village. Vinification takes place entirely in steel tanks, i.e. without the use of oak barrels, and this has been the case since the 1970s. The wine doesn’t go through malolactic fermentation, so a high level of acidity is retained. Salon is characterised by a very firm and mineral-driven style with a high acidity as well as a noticeable concentration, and usually requires a long time to mature. This means that young Salon can be rather demanding, and its iconic status is built upon it being without compromise in its style and very age-worthy, Salon is probably the most age-worthy and long-lived of all Champagnes (although the occasional vintage has developed less well than the rest), and brilliant in mature condition. The house is rather restrictive when it comes to which Salon vintages that are released, and the production in a typical vintage is 60 000 bottles and 10 000 magnums. The production in the 2002 vintage was 62 000 bottles. So far, Salon has released the vintages 1905, 1909, 1911, 1914, 1921, 1925, 1928, 1934, 1937, 1942, 1943, 1946, 1947, 1948, 1949, 1951, 1953, 1955, 1956, 1959, 1961, 1964, 1966, 1969, 1971, 1973, 1976, 1979, 1982, 1983, 1985, 1988, 1990, 1995, 1996, 1997, 1999, 2002 (released in 2014), 2004 (released in 2016), and 2006 (released in 2017). Upcoming vintages are 2007 and 2008. None of the vintages 2009-2012 have been produced. Aimé Salon launched his Champagne in 1911, then in 1905 vintage. 1921 is also mentioned as the founding year of the house, which possibly means that the first vintages were bought-in or bottles produced under contract. From 1921 and until sometime in the 1950s, Salon is supposed to have only been served at Maxim in Paris, although rather many bottles must have found their way in other directions given how many older vintages that have been tasted by Salon fanatics and have turned up in the auction market. Following the death of Aimé in 1943, Salon was led by his sister and a grandchild of his sibling, before the family sold to Dubonnet-Cinzano in 1963. In 1971, Salon lost the Clos Tarin vineyard, know known as Clos du Mesnil. In 1978, Dubonnet-Cinzano was purchased by Pernod-Ricard, who in 1988 sold Salon to Laurent-Perrier. The new owner merged Salon with Delamotte, which they had integrated in the Laurent-Perrier group in the same year. As far as I understand , it is only under the Laurent-Perrier ownership that Salon has reached the definite iconic status that their Champagne currently has. Philippe Gonet (NM), which has two vintage Champagnes, both blanc de blancs. Of these, Belemnita is produced only from Le Mesnil-sur-Oger grapes and is named for the fossils found in the chalk in this village. Jean Pernet (NM), which as 17 ha of vineyards in Le Mesnil-sur-Oger, Vertus, Chouilly, Épernay, Chavot, and Leuvrigny. The vintage Champagne is a blanc de blancs. Also sells Champagnes under the brand Camille Jaquet. 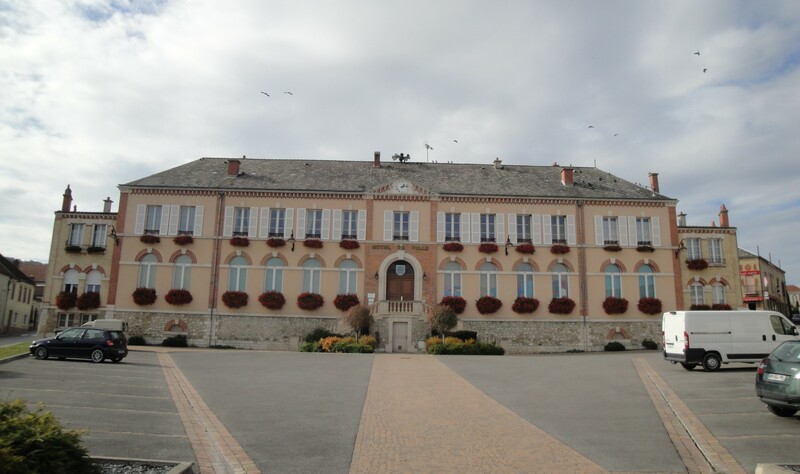 The town hall of Le Mesnil-sur-Oger, Hôtel de Ville, in October 2011. 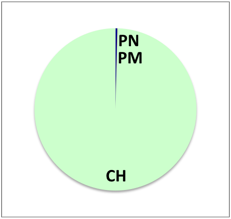 Producer status is indicated where known: RM = récoltant-manipulant, or grower-producers. RC = récoltant-coopérateur, growers that are cooperative members but sell Champagnes under their own name. SR = société de récoltants, owned by a number of growers of the same family and sells under its own name. Smaller producers are placed under this heading when no information regarding producer status is available. Bardy-Chauffert (RC), which has two vintage Champagnes, both blanc de blancs. Of these, Symphonie is produced from old vines. François Billion (RM), the vintage Champagne of which is a blanc de blancs. Bliard-Moriset (RM), the vintage Champagne of which is a blanc de blancs. Claude Cazals (RC/RM – see comment below) has about 9 ha of vineyards in grand cru and premier cru villages in the Côte des Blancs. The regular vintage Champagne is a blanc de blancs. Clos Cazals is a vineyard-designated blanc de blancs from a vineyard in Oger bought by the Cazals family in the 1950s and later renamed after the family. 1995 was the first vintage of the vineyard-designated Champagne, which is a 100% Chardonnay from a selection of old vines in this site. La Chapelle du Clos is a non-vintage blanc de blancs from the “middle-aged” part of Clos Cazals (which also includes a chapel) which was launched in 2014 and at this launch was produced using the 2006 base vintage. In terms of the producer status of Cazals, their webpage indicates in rather big letters that they are Récoltant-Manipulant, but all bottles I’ve seen (including their two 2002s) indicate RC, i.e., Récoltant-Cooperateur. My guess is therefore that they have converted to RM status more recently than these vintages. Guy Charlemagne (SR), which has 15 ha of vineyards, mainly in Le Mesnil-sur-Oger and Oger, but also Sézanne, Glannes, Mancy, and Cuis with 87% Chardonnay and the rest Pinot Noir. The annual production is 130 000 bottles. The vintage Champagne is called Mesnillésime and is a blanc de blancs vinified in oak barrels. Robert Charlemagne (RM), has a bit more than 4 ha of vineyards in the Côte des Blancs. The vintage Champagne is a blanc de blancs. Gimonnet-Gonet (RM), has 13.5 ha of vineyards, to a large part in the Côte des Blancs (Chouilly, Cramant, Oiry, Oger, and Le Mesnil-sur-Oger) but also in the Vallée de la Marne (Bouquigny, Vincelles, Verneuil, and Trélou). The range includes two vintage Champagnes: Prestige which is a blanc de blancs from the Côte des Blancs and Carat du Mesnil which is a blanc de blancs from old vines in Le Mesnil-sur-Oger. François Girard (RC), whose vintage Champagne is a blanc de blancs. Launois Père & Fils (RM), a Special Club producer with 21 ha of vineyards in the Côte des Blancs and the Sézannais with 90% Chardonnay and 10% Pinot Noir. The annual production is 220 000 bottles. Their regular vintage Champagne is a blanc de blancs. Special Club is a vintage blanc de blancs from old vines. The current vintage (as of 2015) is 2006 and earlier vintages include e.g. 2002 and 2005. Launois also runs a museum, see above. Jean-Pierre Launois (RC), whose vintage Champagne is a blanc de blancs. Launois-Lebrun (RC), which has two vintage Champagnes in their range, both blanc de blancs, where Cuvée Or du Temps originates from old vines in Le Mesnil-sur-Oger. Luc Mojard (RC), whose vintage Champagne is a blanc de blancs from Le Mesnil-sur-Oger. Pierre Moncuit (RM), a good producer with 20 ha of vineyards, mostly around Le Mesnil-sur-Oger but also about 5 ha in the Sézannais. The range includes two vintage blanc de blancs, of which Nicole Moncuit Vieille Vigne is sourced from old vines in the vineyard site Les Chétillons. Robert Moncuit (RM). Grande Cuvée is sourced from two vineyards with old vines and is vinified in oak barrels. André Moussy (RC), with an annual production of about 15 000 bottles. Cuvée Prestige Millésime consists of 50% Chardonnay and 50% Pinot Noir (refers to the 2008 vintage). Also sells Champagnes under the name Julien Moussy. The two vintage Champagnes of that range are blanc de blancs, of which Secret du Terroir Vieilles Vignes is sourced from old vines in Le Mesnil-sur-Oger. Bernard Pertois (RC), has 15 ha of vineyards, of which 7 ha Chardonnay. Some is sold and 4.5 ha of Chardonnay are used for their own Champagnes. Pertois-Moriset (RM), a Special Club producer with 18.6 ha of vineyards, of which about 12 ha Chardonnay in the Côte des Blancs and about 6.5 ha in the Sézannais (about 60% Pinot Noir and 40% Chardonnay). The range includes two vintage Champagnes, both blanc de blancs. The regular vintage Champagne originates from Côte des Blancs and Cuvée Camille from Le Mesnil-sur-Oger. They became members of Club Trésors de Champagne, the organisation behind Special Club, in early 2015, so it will take a couple of years before their first Special Club Champagne is launched. Pierre Péters (RM), a well-renowned producer with a bit more than 19 ha of vineyards, mostly consisting of Chardonnay in Le Mesnil-sur-Oger, Oger, Avize, and Cramant. L’Esprit is the regular vintage Champagne, a blanc de blancs. Les Chétillons is the prestige Champagne of the range, a vintage blanc de blancs from the vineyard site of this name. It used to be called simply Cuvée Spéciale, and this text is still found on the lables. In the pipeline, there is an additional vineyard-designated blanc de blancs, Le Montjoly, with 2012 being the first vintage. Réserve Oubliée is produced using many base vintages. Patrick Regnault (RM), whose regular vintage Champagne is a blanc de blancs and whose Réserve is a vintage Champagne composed of Chardonnay from old vines and a smaller proportion of Pinot Noir. Esprit d’Auteur consists of Chardonnay vinified in oak barrels. Alain Robert, not to be confused with A. Robert in Fossoy. André Robert (RM), has 14 ha of vineyards. The range includes three vintage Champagne that are all oak barrel-vinified and produced without malolactic fermentation: an Extra Brut with is a blanc de blancs, Le Mesnil which also is a blanc de blancs, and Séduction which is a blend of 55% Chardonnay and 45% Pinot Noir (refers to the 2007 vintage). Michel Rocourt (RM), has 5.6 ha of vineyards in Le Mesnil-sur-Oger (0.2 ha) and in Vertus and Villeneuve (together 5.4 ha). The range includes two vintage blanc de blanc, of which one is called La Rose du Mesnil. Solor-Descôtes (RM) with the company name Jeannine Solor. Louis Sostène (RM), which is produced by the winemaker Pierre Gonet of the house Philippe Gonet using his wife’s vineyards. Encry (MA = marque d’acheteur), which was created through a cooperation between Enrico Baldin, an Italian, and Jean Michel Turgy. This started in 2004 and involves 2.5 ha of vineyards. Initially, there are supposed to have been some problems with the Champagne organisation CIVC, but the solution seems to have been the current MA status. The vintage Champagne is a blanc de blancs. J. L. Vergnon (RM), which has most of their vineyards in Avize, Oger, and Le Mesnil-sur Oger. The range includes two vintage Champagnes: Résonance, which is a blanc de blancs from Le Mesnil-sur-Oger and Oger and is vinified in steel tanks, and Confidence which is an oak barrel-vinified blanc de blancs from Le Mesnil-sur-Oger without dosage (Brut Nature). Comment: the list may not be complete. André Jacquart (RM), formerly A. Jacquart & Fils on the labels, was located in Le Mesnil-sur-Oger until 2004, but then moved to Vertus. 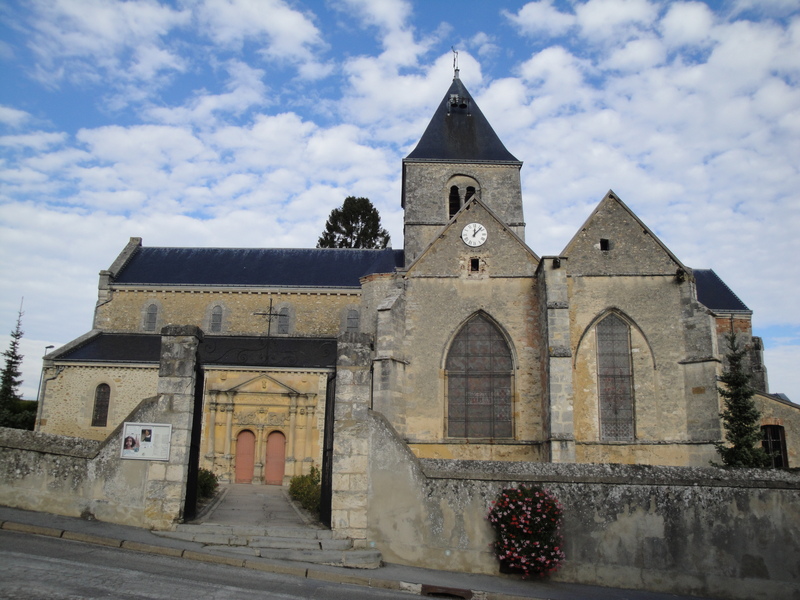 The church in Le Mesnil-sur-Oger in October 2011. Union des Propriétaires Récoltants (UPR) is a cooperative in Le Mesnil-sur-Oger founded in 1937 with 667 members that have 309.96 ha of vineyards (refers to the situation in 2014). UPR is a member of the major cooperative Union Champagne in Avize (which is behind the De Saint Gall brand). The cooperative was founded in 1937, when times were hard for the Champagne producers, and was installed in buildings purchased from Henriot. In 1959-1963, their own facilities were expanded and modernised. In 1966, Union Champagne was founded by UPR and three other cooperatives (in Oger, Vertus, and Cumières). Initially, UPR was used as the common facility, before another was found in Avize. In 1970, a new building was erected in all haste to handle the record-sized harvest of that year. Le Mesnil, which have two vintage Champagnes in the range, both blanc de blancs: Sublime which originates from different parts of the Côte des Blancs and Le Mesnil Cuvée Prestige which originates from the best plots in Le Mesnil-sur-Oger. Also a white Coteaux Champenois, i.e., from Chardonnay, is part of the range. The cemetery of Le Mesnil-sur-Oger occupies a very favourable spot in the slope above the village, surrounded by vineyards. Photo taken in October 2011. Website of the Le Mesnil-sur-Ogers commune. UMC’s new village profile of Le Mesnil-sur-Oger. Vineyard map of Le Mesnil-sur-Oger at weinlagen.info. This entry was posted in Champagne villages and tagged Le Mesnil-sur-Oger. Bookmark the permalink.